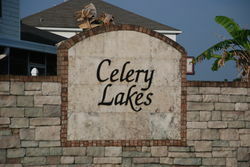 Celery Lakes is a newer subdivision located off Celery Avenue in Sanford. Originally developed by Maronda Homes beginning in 2004, the community consists of single and two story homes with two car garages. Shopping and restaurants can be found nearby on 17-92 and easy access to both I-4 and 417 are nearby for easy commuting.